1Department of Soil Science and Agricultural Chemistry, University of Agricultural Sciences, GKVK, Bengaluru, Karnataka - 560065 India. The increasing demand for crop production and productivity can only be met with intensive cropping techniques that further aggravate the use of high-yielding soil-exhausting varieties, fertilizers and crop protection chemicals. The predicted result is deterioration of these agro-ecosystems and soil health. Therefore, an urgent need exists to find solutions that can maintain sustainable production and that include better assessment of the soil biogeochemistry and nutrient dynamics in rice ecosystems (Krishna, 2010). Rice is of one of the most important staple foods worldwide. Similar to most of the cultivated cereals, rice is also considered as a silicon accumulator (Guntzer et al., 2012). Although it has not been recognized as an essential element for plant growth, many studies have documented that Si might be helpful in alleviating various biotic and abiotic stresses and increasing yield even in non-stressed conditions (Camargo et al., 2017; Liang et al., 2015). These beneficial effects of silicon could result in increased production and productivity of rice and should be considered in agricultural practices. Si is the most common element in the surface of the continent, but the fraction that is bioavailable to plants differs greatly according to the parent rock composition and the degree of weathering (Haynes, 2014). It has been shown that in certain cultivated areas, the available Si was below the optimal limit required to achieve the predicted yield of rice crops (Prakash, 2002), and hence, the need exists for silicon fertilization. Different types of sources for Si fertilizers have been tested, including industrial by-products and materials extracted from mines (Castro et al., 2016; Liang et al., 2015). However, those sources might be unsuitable due to high cost or high heavy metal content, and others such as diatomaceous earth are not sufficiently documented. Diatomaceous earth (DE) or diatomite refers to sedimentary rocks that consist primarily of opaline frustules of diatoms (Bates and Jackson, 1987). DE occurs in many areas of the world and has unique physical characteristics, such as high permeability (0.1-10 mD) and porosity (35-65%) (Murer et al., 2000), small particle size, low thermal conductivity and density (Hassan et al., 1999), and high surface area (Gao et al., 2005). DE has proven useful for improving the physical properties of soils. Aksakal et al. (2013) showed that DE protected large aggregate formation in clay-textured soils and decreased the maximum dry bulk density (MBD) but increased the optimum moisture content (OMC). Compared with the control, the highest DE application dose (30%) decreased the MBD with the rates of 10.4%, 14.0 % and 9.0% in sandy loam, loam and clay textured soils, respectively, but it increased the OMC values with rates of 49.1%, 42.2% and 38.5%. The “stretchy” structure of DE also increased the water retention capacity. Although DE application had no effect on the wilting point (pF 4.18), it significantly increased the field capacity (pF 2.52) of soils. DE acts as an effective amendment to improve the water-holding capacity of light-textured soils sandy soils. Among the substrates tested, the highest water-holding capacity was obtained with application of 30% DE with a size of 2-4 mm (Angin et al., 2011). Applications of DE to soils have also been proven beneficial to plants by improving the physical properties of soils. Addition of DE increased the root number and length and the leaf area in cull strawberries (Ilker et al., 2011). A few studies have shown that application of DE can be beneficial for plants as a source of Si. Diatomaceous earth is formed by diatom frustules composed of amorphous Si (BSi) that is easily soluble compared to the other silicates common in soils (Fraysse et al., 2009). Rizwan et al. (2012) showed that DE application might reduce the toxicity of Cd in wheat and attributed this effect to Si, which induced a decrease in available Cd in the soil. At the plant level, a decrease of Cd translocation to shoots was reported. Abdalla (2010) attributed better morphological increments and nutrient uptake in fava beans treated by DE to Si. Pati et al. (2016) showed that application of DE as Si fertilizer significantly increased the yield of rice crops in India, but Berthelsen et al. (2003) showed that DE generally did not improve the yield of sugarcane in Australia. Such a discrepancy for crops might be due to environmental conditions such as water regime and geochemical conditions that can affect the dissolution of Si from DE. For instance, the solubility of amorphous silica is limited at low pH (Fraysse et al., 2009). Another factor is the presence of major impurities in the DE that might limit the Si delivered to solution. Many raw DE materials are not entirely composed of diatom frustules but also contain significant amounts of clay minerals, quartz or calcium carbonate (Pedersen et al., 2004; Ilia et al., 2009). Accordingly, the need exist for further research toward an improved understanding of the mechanism by which DE is beneficial in Si uptake and yield of Si accumulators. Based on this background, an investigation was undertaken to better assess the effect of graded levels of DE on Si uptake, growth and yield of rice in Southern India. A study (pot experiment) was conducted at the Department of Soil Science and Agricultural Chemistry, UAS, GKVK, Bengaluru to investigate the dissolution and release of silicon from DE and its effect on the growth and yield of rice. The experiments were performed in three types of soils collected from different locations, namely, acidic (Typic Kandiustults), neutral (Typic ustalfs) and alkaline (Typic Haplusterts) soils of Karnataka, South India. DE from Agripower Pvt. Ltd, Australia was used in the study. The soils were air dried, crushed to pass through a 2 mm sieve and used in the experiment. The study began by taking 5 kg of soil from each location and filling plastic pots treated with graded levels of DE maintained under 100% of field capacity (FC) and submerged (SUB) moisture conditions for 120 days. The soil was thoroughly mixed with the recommended dose of fertilizer (RDF - 100:50:50 N: P2O5: K2O kg ha-1) for rice and different levels of DE at 0, 150, 300 and 600 kg ha-1 of DE (Table 3) equivalent to rates of 0, 0.075, 0.15, 0.3 g kg-1 of soil. The experiment consisted of 8 treatments, namely, T1: FC - RDF alone (control), T2: FC - RDF +DE @ 150 kg ha-1, T3: FC - RDF +DE @ 300 kg ha-1, T4: FC - RDF +DE @ 600 kg ha-1, T5: SUB - RDF alone (control), T6: SUB - RDF+ DE @150 kg ha-1, T7: SUB - RDF+DE @ 300 kg ha-1 and T8: SUB - RDF+DE @600 kg ha-1. Each treatment was performed in triplicate. Rice seedlings (variety: JGL 1798) at the age of 21 days were transplanted into the pots and the moisture content was maintained at field capacity and submerged conditions. The plant samples were collected at harvest and subjected to the analysis described below. Rice plants were washed with distilled water to remove soil contamination. Plant samples were dried in an oven at 75 °C until a constant dry weight was obtained. The dry plant samples were weighed, ground to a fine powder and used in further analysis. Panicles were separately collected and grains were separated from the panicles. The grain weight was observed and analyzed for Si content. The powdered grain and straw samples were dried in an oven at 70 °C for 2-3 hrs prior to analysis. The sample (0.1 g) was digested in a mixture of 7 ml of HNO3 (70 %, 2 ml of H2O2 (30 %) and 1 ml of HF (40%) using a microwave digestion system (Milestone-start D) with the following steps: 1000 watts for 17 minutes, 1000 watts for 10 minutes and venting for 10 minutes. The digested samples were diluted to 50 ml with 4 percent boric acid (Ma and Takahashi, 2002). The Si concentration in the digested solution was determined as described. An amount of 0.5 ml of the digested aliquot was transferred to a plastic centrifuge tube, to which was added 3.75 ml of 0.2 N HCl, 0.5 ml of 10 % ammonium molybdate ((NH4)6Mo7O2), 0.5 ml of 20% tartaric acid and 0.5 ml of reducing agent (amino naphtholsulfonic acid-ANSA), and the volume was topped up to 12.5 ml with distilled water. After one hour, the absorbance was measured at 600 nm with a UV-visible spectrophotometer (Shimadzu) (Ma and Takahashi, 2002). Standards (0, 0.2, 0.4, 0.8 and 1.2 mg l-1) were prepared using Merck Certipur solution (1000 mg l-1). The soil and DE were analyzed before the experiment for their physicochemical properties. Soil pH and EC were measured in a suspension with a 1:2.5 water ratio. The soil textural class was determined by following the International Pipette method (Jackson, 1973). Available N was determined by the alkaline potassium permanganate method (Subbaiah and Asija, 1949). Available P2O5 was estimated by Bray’s method (Bray and Kurtz, 1945) for acidic and neutral soils and by the Olsen method Olsen, 1954 for alkaline soil. Available K and exchangeable Ca and Mg were extracted using 1N ammonium acetate and K was analyzed using flame photometry (Jackson, 1973). Exchangeable Ca and Mg were determined by the complexometric titration method (Baruah and Barthakur, 1997). Soluble silicon concentration available for plant (PAS) was determined by soil extraction using 0.01 M CaCl2, and Si was measured using UV-visible spectrophotometry (Haysom and Chapman, 1975). The field capacity of soil was determined using a pressure plate apparatus (Baruah and Barthakur, 1997) at laboratory condition. Comparisons between treatments were statistically analyzed using one-way ANOVA at a significance level of P<0.05 via the Fisher test using XLSTAT (Addinsoft 2017. XLSTAT 2017: Data Analysis and Statistical Solution for Microsoft Excel. Paris, France, 2017). The study soils (Table 1) were characterized using a large range of pH, from 4.48 (acidic) to 8.86 (alkaline). Soil EC was found to be in the normal range (< 0.8 dSm-1) in all soils but higher in alkaline soil (0.74 dSm-1). 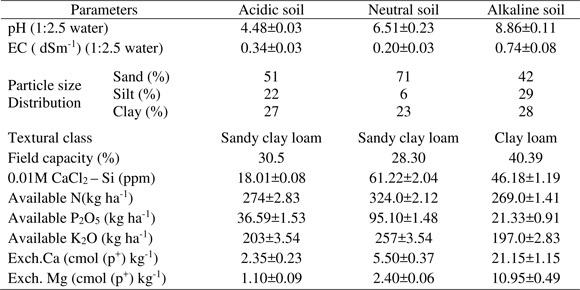 The texture was dominated by the sand fraction in the 3 soils with the highest values for neutral soil (conversely with the lowest value for silt), whereas the percentage of the clay fraction was roughly the same (23 to 27%). Quartz, feldspar, and muscovite were detected in all three soils. Chlorite was detected in acidic and alkaline soils and amphibolite only in alkaline soils (Figure 1). The composition of secondary minerals was found to display significant variation as well. Goethite was detected in neutral soil, gibbsite in acidic soil, kaolinite in acidic and neutral soils and smectite in alkaline soil only. Carbonates (calcite) were detected in alkaline soil. Neutral soil had more all nutrients compared to acidic and alkaline soils (Table 1), whereas Ca and Mg were found to be high in alkaline soil. CaCl2-extractable Si was higher in neutral soil (61.22 ppm) followed by alkaline (46.18 ppm) and acidic (18.01 ppm) soils. DE was characterized by an alkaline pH (9.21) and an electrical conductivity similar to that of alkaline soil. 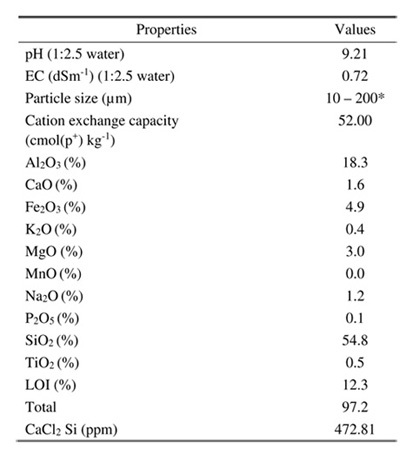 CaCl2-extractable Si of DE (473 ppm) was an order of magnitude higher than values found in the soil (Table 2). 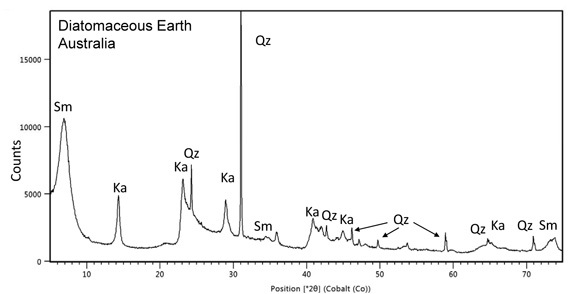 DE also contained significant amount of Al2O3, Fe2O3 and MgO and the XRD analysis showed a predominance of quartz, kaolinite and smectite (Figure 1). The existence of amorphous silicon was not clearly identified because no characteristic peak was observed at 26-27°2(, a characteristic identification technique revealed by Dixon and Weed, (1989). However, the presence of diatom tests was confirmed under SEM together with sponge spicules (Figure 2). Table 1: Physicochemical properties of acidic, neutral and alkaline soil. For duplicate analysis, average values are indicated with ± SD. Table 2: Composition of diatomaceous earth. 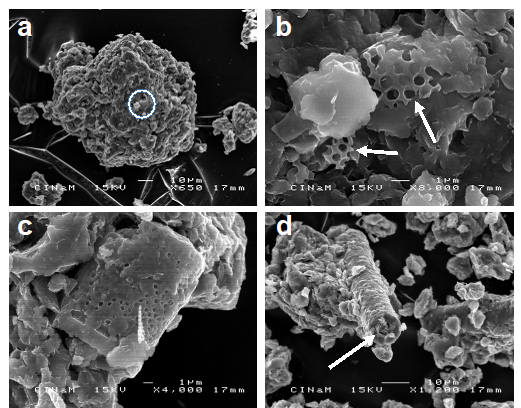 Figure 2: SEM microphotographs of the diatomaceous earth (DE) used in the experiments. a) aggregate showing that the material is not entirely composed of diatom frustules, where the circle shows the location of b); b) close up of the circle in a) showing two fragments of diatom frustules (arrows); c) a well preserved diatom frustule; d) material containing a sponge spicule (arrow). Lower biomass was recorded in alkaline soil (from 0.5 to 6.8 g pot-1) compared to acidic soil (from 6.2 to 14.6 g pot-1) and neutral soil (from 9.4 to 20.1 g pot-1) if all treatments (DE added and moisture condition) are taken as a whole. Straw biomass (g pot-1) was higher at the SUB than at the FC moisture condition in all treatments for acidic soil and in all treatments except for the control for alkaline soils (Figure 3). For neutral soil, straw biomass was generally not significantly different of the two moisture conditions. For a given moisture condition, the effect of DE application was contrasted among soils, and no regular increase of straw biomass was recorded with graded levels of added DE. However, compared to the control, application of 600 kg DE ha-1 significantly increased the straw biomass grown in acidic and neutral soils under the SUB condition and in alkaline soil under both the SUB and FC moisture conditions. Under the FC moisture condition, DE application did not increase the straw biomass for acidic and neutral soils. Figure 3: Effect of graded levels of diatomaceous earth on straw and grain yield (g pot-1) under field capacity and submergence moisture conditions in acidic, neutral and alkaline soils. Each value represents the mean value of 3 replications; values having same letters do not differ significantly at P≤0.05. The grain yield was lower in plants grown on FC than on SUB moisture conditions regardless of the soil type and the levels of DE application (Figure 3). Higher grain yield was observed with the highest rate of DE application (600 kg DE ha-1) under the SUB moisture condition in all three soils. Under the SUB moisture condition, the increase in yield, calculated as = 100x ((yield at 600 kg DE ha-1 -yield without DE)/ (yield without DE)), was recorded as +29 ± 8% for acidic soil, +19 ± 11% for neutral soil and +455 ± 106 % for alkaline soil. Under the FC moisture condition, grain yield increase was observed in acidic soil at 150 and 600 kg DE ha-1 and in neutral soil at 150 kg DE ha-1. For straw biomass, the grain yield presented a roughly lower range of values for alkaline soil (from 0.7 to 5.2 g pot-1) than for acidic soil (from 2.7 to 9 g pot-1) and neutral soil (from 4.1 to 12.6 g pot-1). For intermediate DE treatments under the SUB condition, the results were contrasted. The maximum grain yield was achieved at only 300 kg DE ha-1 for acidic soils and was even lower for alkaline soil at 150 kg DE ha-1. 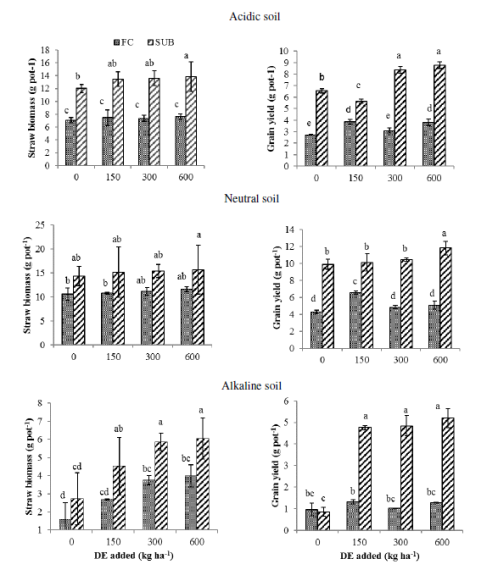 Higher straw Si content was observed in neutral soil (range = 6.3-8.3% Si) than in alkaline soil (range = 5-6.6% Si) and acidic soil (range = 4-5.3% Si) (Figure 4), whereas grain Si content roughly decreased in the same range in all three types of soils (0.4-1.2% Si) (Figure 4). Plants treated with the highest level of DE recorded higher straw Si content than the control for neutral and alkaline soils under the SUB condition and for acidic and alkaline soils at the FC conditions, but no clear trend was observed among the intermediate treatments. Generally, we did not observe a significant difference in straw Si content between moisture regimes for a given treatment. An increase in grain Si content between the control and the highest level of DE was observed under the SUB condition in alkaline soil only. Under the FC condition, treatments of different levels of DE did not significantly affect the grain Si content for each soil. 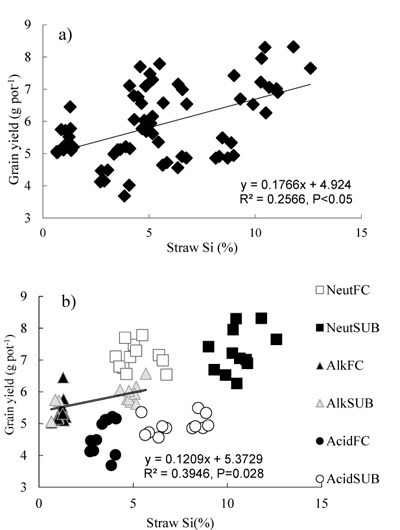 Figure 4: Effect of graded levels of diatomaceous earth on straw and grain Si (%) under field capacity and submergence moisture conditions in acidic, neutral and alkaline soils. Each value represents the mean value of 3 replications; values having same letters do not differ significantly at P≤0.05. Total Si uptake was calculated by summation (biomass straw x Si straw) +(biomass grain x Si grain). As expected, the Si uptake under the SUB conditions was generally higher than under the FC condition. The highest values were obtained for neutral soil (both moisture conditions) followed by acidic soils and alkaline soils (Figure 5). With increasing DE application, Si uptake increased linearly for acidic and alkaline soil but not in neutral soil under the SUB moisture condition, whereas under the FC condition, Si uptake was increased over the control only in the alkaline soil. 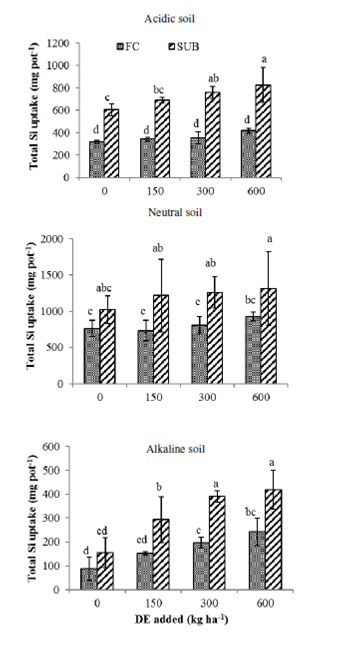 Figure 5: Effect of graded levels of diatomaceous earth on total Si uptake (mg pot-1) under field capacity and submergence moisture conditions in acidic, neutral and alkaline soils. Each value represents the mean value of 3 replications; values having same letters do not differ significantly at P≤0.05. Our findings offered evidence from ICP-AES, XRD and SEM analyses that the DE used in the study was not composed entirely of diatom frustules (amorphous silica) but also consisted of silicates (contributed from different type of clays) and other categories of biogenic silica (BSi) particles such as sponge spicules (Figure 1 and 2). The BSi particles detected in SEM were probably composed of amorphous silica because opal-C or cristobalite, although common in other DE (Eichhubl and Behl, 1998), were not detected by XRD. An estimate of the contribution of Si from DE added into the pots (as calculated from the chemical composition given in Table 2) was calculated from the difference between Si uptake by rice for a given level of DE minus the uptake by the control (Table 3). The Si uptake by the roots was not measured, but it can be estimated as only 10% of the uptake by shoots (Jeon, 2006). The calculated percentage of shoot uptake from DE ranged from 57-79 % in acidic soils to 40-57 % in neutral soils and 59-152% in alkaline soils. These estimates were not in good agreement with our XRD data, which should have shown a peak at 26-27°2 ( if the DE contains 40 % of amorphous silica. Therefore, we suggested that other sources of Si from DE, such as quartz and clay minerals, might have contributed to the Si uptake by rice. This reasoning can also serve as a possible mechanism/evidence for the significant response of rice to applied DE, as noted by Pati et al. (2016). As observed in the present investigation, the theoretical percentage of shoot uptake from DE was >100 in alkaline soil (Table 3). The dissolution of Si from DE alone cannot be the only contributor to such a high value in alkaline soil and suggests enhanced dissolution of silica sources from the soil. Such a hypothesis is in good agreement with the previous findings that addition of DE might improve water retention (Sahin et al., 1997), and as a consequence, might drive better adsorption of the nutrients and Si. Table 3: Estimation of the uptake of Si by DE added in the soils. Comparisons between two moisture regimes show significantly higher yield values for SUB than FC for acidic and neutral soils but not for alkaline soil without DE addition. As discussed previously for Si uptake, the availability of nutrients depends on the water availability in acidic and neutral soils, but in alkaline soil, higher clay content combined with salinity prevents the growth of rice. The correlation between the Si concentration in the shoots and the yield can be used as a demonstration of the benefits of Si to crops (Ma and Takahashi, 2002). In this work, such a plot for the data as whole showed a significant correlation (Figure 6a). However, a closer look (Figure 6b) indicated that for a given soil and moisture condition (corresponding to 12 data), the correlation was only slightly significant for alkaline soils in the SUB conditions. Both parameters (yield and straw Si content) tended to increase from the FC to the SUB condition for neutral and acidic soils. Therefore, our data showed that the Si content of straw was generally not a good representation of the effect of DE addition for explanation of the increase in the yield. The increase in yield due to Si application is not new and has been documented previously using DE (Pati et al., 2016) and many other sources (Liang et al., 2015). We confirmed the dissolution and release of silicon in our previous incubation experiment (Prakash et al., 2016) over different intervals of up to 120 days in acidic and alkaline soil and noted higher PAS with the application of DE compared to the control in both types of soil. However, DE was able to affect the PAS of the soil and also plant growth due to it content of various nutrients (Table 1). Although we did not measure the available N, P and K for DE, according to the total content of P2O5 and K2O (0.1 and 0.4 wt%, respectively, Table 1), application of 600 kg ha-1 of DE can supply 0.39 kg ha-1 of P2O5 and 2.22 of K2O kg ha-1. These values were quite small compared to the nutrient content of the soils and of the RDF applied. Accordingly, the nutrient added to the soils by DE application cannot explain the increase in the yield. 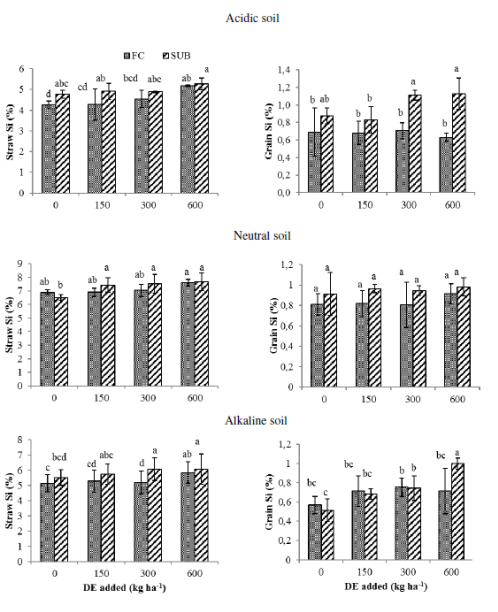 In this work, the slightly better response for acidic soil than for neutral soil at SUB - RDF+DE @600 kg ha-1 ( + 29 ± 8% and 19 ± 11 %, respectively ) was in good agreement with the study by Tavakkoli et al. (2011) for Si and biomass production (grain yield not shown), offering evidence that acidic weathered soils were more depleted in PAS and were more reactive to Si fertilization. The increase in nutrient availability following Si application is well documented but the mechanisms remain unclear (Liang et al., 2015). The increase of DSi might have desorbed P from the mineral surfaces and allowed it to become more bioavailable. However, such a mechanism depends on pH because the adsorption of Si increases with increasing pH and achieves a peak at pH 9 (Parfitt, 1978; Beckwith and Reeve, 1963), whereas the opposite occurs for P (Obihara and Russel, 1972). A more positive response for alkaline soil (+455 ± 106 %) would be in a good agreement with the mechanism of Si/P displacement. Additionally, DE might have adsorbed more soluble salts, including sodium, which mainly inhibited root development and establishment of the crop and thereby improved yield under alkaline soils. In addition, in acidic conditions, supplemental input of DSi might have reduced the toxicity of metals such as Al and indirectly influenced the better plant growth (Wallace, 1993). Alkaline soils, which are also affected by salinity, gave the best response to DE for yield with values up to 455 %, which is probably the highest reported value. Under the alkaline soil condition, the roots of the plant are highly affected in the early stage of their establishment. Especially under the high salt content of the soils, root establishment is restricted to a greater extent. In the current study, growth and establishment of the transplanted rice under SUB in alkaline soil experienced similar stress, and the straw and yield levels were quite low. The addition of DE greatly improved the yield, but the values remained low compared to the other soils. The dramatic increase of the yield in such a stressed soil demonstrates the capacity of DE to improve the rice growth. Such an improvement was probably the result of a combination of Si and the physical property of the DE material. In addition, applied Si as a DE source must have stimulated the plants to absorb higher K+ (data not reported) under salt stress, as noted by Liang (1999). Potassium plays an important role in contributing to the survival of crop plants under salt stress (Cakmak, 2005, Mahdieh et al, 2015). Figure 6: Plot of straw Si concentration (in dry weight %) vs. grain yield for the data as a whole (a) and b) for the 6 soil/moisture conditions in the studied cases; only significant linear regression equations are given. Without DE application, we showed that the water regime is not a limiting factor for Si and nutrient uptake in alkaline soil. Application of DE on soils fertilized by RDF significantly increased the grain yield from 150 kg ha-1 for alkaline soil, 300 kg ha-1 for acidic soil and 600 kg ha-1 for neutral soil at the SUB conditions, whereas at field capacity, the increase in yield was not significant. The total Si uptake was significant only for acidic soil at the SUB conditions at 600 kg ha-1 of DE and for alkaline soil for the SUB and FC conditions. The mineralogical study of the DE used in this study shows that it was not entirely composed of amorphous silica. To explain the excess of Si uptake following DE application, our data suggest that the dissolution of clay minerals and quartz from DE also might have been involved.DE application not only contributed additional Si for improved plant growth but its specific texture also likely aided in improving the water retention locally and consequently improving the solubilization of Si and the nutrients. Addition of DE for improved crop yield offers an interesting application in good agreement with previous work. However, the chemistry and mineralogy of the soils and the DE used should be characterized in detail to document the mechanisms of Si and nutrient uptake.